Using card sketches is a great way to get your mojo up and running again if yours has gone missing lately. Definition: Card sketches have many other names and are also known as card layouts, card patterns, card templates and card maps. 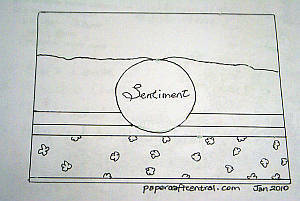 The basic principle of using a skecth is very simple and that is to provide card makers with a design layout for a card. I find that after making loads of Christmas cards, it is sometimes hard to think of making a different type of card using not-so-Christmassy (read non-traditional) colours. This year was no exception. I needed inspiration to make six birthday cards for some friends this month. So I made a sketch! You can make sketches with pencil and paper, starting out with a scrap of paper the same size you want your finished project to be. That way you can get your measurements easily too. 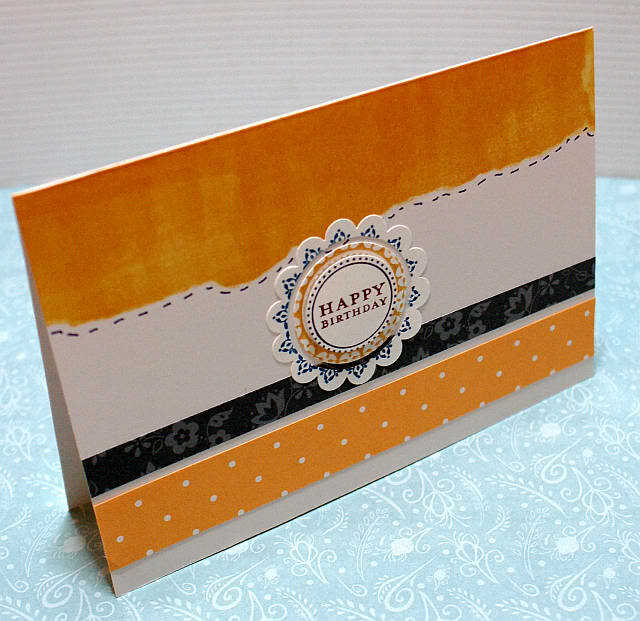 Just copy the design elements you draw and make them out of your true cardmaking materials. You can cut out elements you want to use and lay them on your sketch without drawing them. If you want to keep a certain arrangement in mind, take a photo of it with your phone to refer back to. You can also get fancy, formal and accurate and use a computer program to make your sketches. Some people use Adobe Photo Elements or Paint. Even Microsoft Office Word has a drawing program. I just drew this one kind of free-hand with a pencil and paper. Now having a sketch is one thing, but how about inspiring yourself with colour? For this month, I challenged myself to use colours I don't normally use for birthday cards. With that idea in mind, I consulted my sketch, then my colour wheel, then bravely winged it and decided to use some Stampin' Up! More Mustard ink (retired) to brayer onto the top of my card to correspond with the wavy line. Now it was time to choose an image to carry my sentiment and add some interest. I picked out an intricate circle stamp and stamped three of them in More Mustard, Bravo Burgundy and Not Quite Navy. I stamped the sentiment in Not Quite Navy or Bravo Burgundy to make a contrast with the inner circle colour. 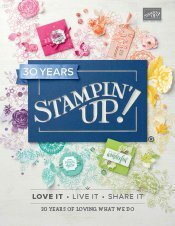 NOTE: If you would like to purchase any of the supplies I used here, you can search for current ones in the Australian Stampin' Up! catalogues featured in the right hand column of this page.If products I used are retired, there are bound to be some new, up-to-date colours that could appeal to you instead. I am showing you a process on this page, not trying to keep all the products absolutely current as they do change with regularity! Now it's Your Turn to Create with Card Sketches! If you feel inspired to make a greeting using any of my suggestions, I sure would love to see it.